Our number one priority at Kentucky Jet Charter is the safety of you and your loved ones. It is our mission to provide services that meet your needs during both times of health, and in times of difficulty. Many clients that are in a wheelchair full-time wishing to vacation or needing to charter a private medical flight may have special transportation requirements in regards to their wheelchair accessibility. Most private aircraft are not equipped with the capabilities to accommodate these needs, and providers do not have the resources to assist with the demand. Kentucky Jet Charter can help with your travel needs. We have direct access to a beautiful Challenger 604 long-range jet which has been fitted with a state-of-the-art titanium hydraulic lift system for passengers with these needs. Passengers must be transferred from their current wheelchair into an aisle wheelchair that is used to board. 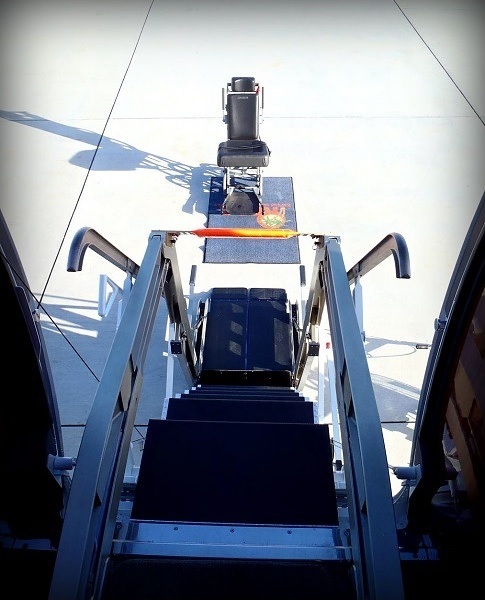 The high-tech wheelchair lift system can support passengers weighing up to 400 pounds, and passengers may be able to store their wheelchair on board depending on the make, model and dimensions. The Challenger 604 wheelchair accessible private jet provides a new level of ease and comfort to those who need it most. We can cater to passengers that are moving to another state, traveling between facilities or hospitals, attending a family get-together, or going on an exotic vacation, chartering this aircraft will create a more convenient travel experience. Offering unparalleled comfort and reliability for our private jet charter clientele, this Challenger 604 has the largest cabin of any aircraft in its class, and comfortable seating for up to 12 passengers. The wide cabin of this jet also provides passengers with options regarding seating arrangements with four separate, adjacently-positioned plush captain chairs and fold out coffee tables in between. For entertainment, this hydraulic-lift equipped Bombardier Challenger also features an Airshow 400 system with Dual DVD players and viewing screens, and you can stay connected during your flight with a built-in WiFi connection. A flight range of over 4,000 statute miles will allow this long-range jet to fly clients privately from coast-to-coast or between continents quickly and comfortably. Every flight will need to be reviewed and all details for each passenger wheelchair is case by case whether it can be accommodated. Most wheelchairs accommodated are manual only. Most electric and battery powered will not be accommodated however some may be acceptable and are reviewed case by case. 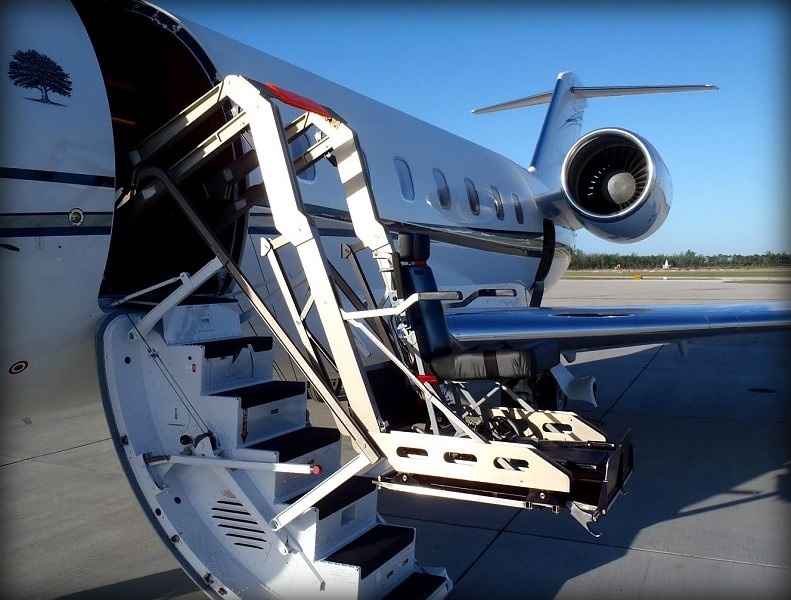 Our team at Kentucky Jet Charter understands the challenges of arranging flights for passengers with a wheelchair, and we have extensive experience with Medical Charter Flights. Our team will do everything we can to ensure your satisfaction based on your specific desires. This includes times when a passenger may need medical assistance or supervision, where we can arrange an Air Ambulance Flight with third party medical professionals and equipment on-board. If you or a loved one is in need of a private jet with the most comfortable wheelchair access available, call or e-mail us and let us help arrange your private flight.